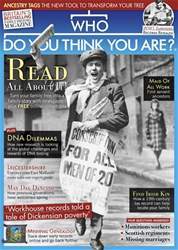 (1 Customer Reviews) | Write Review 13 issues per year Trace your family's past and discover your roots with Who Do You Think You Are? Magazine. The official companion to the successful BBC TV series, Who Do You Think You Are? Magazine delves in to the celebrities’ pasts, features military and social history, recounts the stories of ordinary and extraordinary people and how they used to live. Packed with practical advice, from getting started to expert tips, we show you how to get the most out of online resources and build your own family tree. Was your ancestor a maid of all work? Trace your family's past and discover your roots with Who Do You Think You Are? Magazine. The official companion to the successful BBC TV series, Who Do You Think You Are? Magazine delves in to the celebrities’ pasts, features military and social history, recounts the stories of ordinary and extraordinary people and how they used to live. You'll receive 13 issues during a 1 year Who Do You Think You Are? magazine subscription. Many thanks for taking time to review Who Do You Think You Are? Who Do You Think You Are? probably the best genealogy mag out there. You'll receive 13 issues during a 1 year Who Do You Think You Are? magazine print subscription.